Your vision, our workforce solutions. Every company’s talent requirements are unique. Talent expectations vary for every different organization. Each organization has its own culture, value system, philosophy, mission, and core values. We understand that two jobs, even if their titles are the same can be vastly different from each other. At ThinkByte we constantly strive to find the best candidates for your unique requirements who don't just match the tangible criteria but also are the best cultural fit for your team. We specialize in finding the best talent in the shortest time span for every partner organization. ThinkByte crafts personalized solutions to suit your recruitment needs. Our customer-first philosophy combined with the best-in-class technical expertise to find talent-solutions puts us miles ahead of the competition. 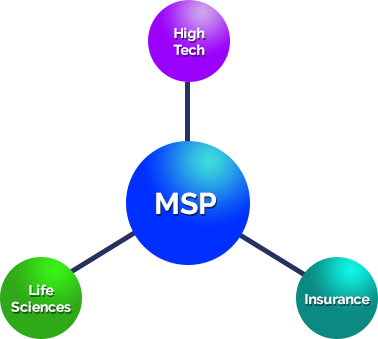 From finding you the best full-time talent solutions to being a trusted MSP partner, we do it all and we do it with finesse. Our team is an exclusive talent solutions partner that brings domain expertise right from the Silicon Valley to your office floor. According to Staffing Industry Analysts (SIA), the average U.S. contingent workforce buyer says 22% of its workforce is non-permanent, and this component will grow to 29% by 2026. From 2016 to 2026, the US High-Tech sector is projected to gain 1.1 million jobs, which is a reason to rejoice for hi-tech recruiters and professionals alike. 58%of insurance companies plan to increase staff during the year due to an expected increase in business and new markets, according to the Semi-Annual U.S. Insurance Labor Outlook Study conducted by The Jacobson Group and Ward Group. Life sciences employment saw a jump of 13.5% between 2006-16, vs 6.9% for total U.S. employment. The surge in Biotechnology research jobs has been 26% since the end of 2013.